Pre/inter face While the page is loading, the search box says Anywhere. The page loads and, in the same box, Try “Miami” replaces Anywhere. Put Milan in the interface, add a couple of dates — one for the arrival, one for the departure —, combine them with the number of fellows travelers. Probably, you are not on a budget. Probably you will ask for an entire place. Check and select the amenities you will never renounce while being elsewhere at home. Among 4 million listing — in more than 190 countries, that served more than 200 million of users since 2008 — the platform will propose you the left solutions from the 15,555 available ones in Milan. If you are looking for an apartment between April the 16th and April the 21st, most probably, the interface will warn you: 203 % more people are looking for homes in Milan. You are coming to town at a popular time. We recommend booking soon. 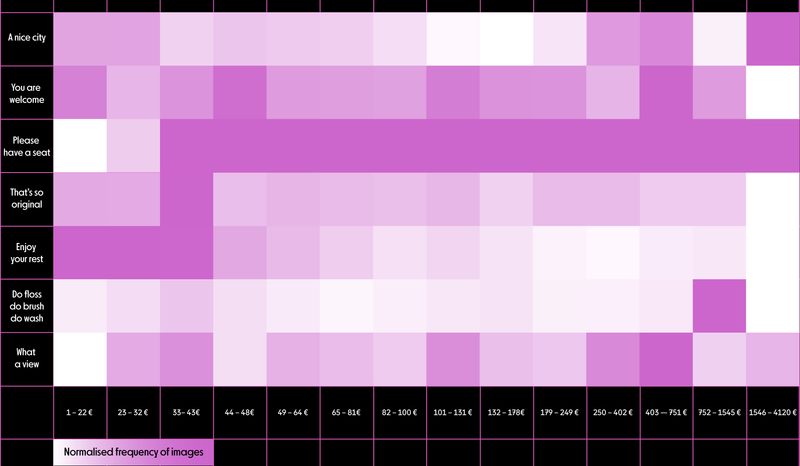 An ordered and paged grid, 3 by 6, is now before your eyes.Each item of the grid is composed by a picture accompanied by a text, plus its price. You can add an item to a wish list, by clicking on the little heart; you can ask for more picture to eventually decide if a listing fits your taste.The texts unceasingly repeat ideal for Design Week, perfect for the Furniture fair, cosy, retro, near this, near that, cute, nice, NOLO style, Navigli style, exclusive,lovely. So small, so big, so nice, so design. Easy/local experiences Places, homes, apartments could be retrieved and used as any other piece of digital information. Cities could be explored and occupied as the extension of filter bubbles and echo chambers. We loop through them by place-specific imagined values and parameters; snapshots of somebody-else-life curated on Instagram; clipping of Kinfolk-ish pages; blog articles featuring in their title cardinal numbers; stars and reviews on Yelp-like apps. Platforms, algorithms, and interfaces align these elements: design drives taste; taste drives consumption; consumption domesticates cities. A domestication that juggles with two antithetic forces. On the one side, the easyfication of the city —allowing for a flow of international workers and companies through globally connected places. On the other, the need to preserve local identities —securing a degree of desirability of services, products, and economies. In the interplay between these two forces, we find less and less frictions and glitches, in experiencing the city. We feel reassured by platfomised services promoting themselves as unique and authentic. Almost everybody could upgrade to a premium-mediocre experience of living, traveling and working anywhere. A flat, cozy anywhere. This is the AirSpace, —a term coined a couple of years ago by Kyle Chayka, a by-product of the neo-liberal adoption of the (pseudo) sharing economy, that has corrupted the hope for a bottom-up radical urbanism. It has fostered, at the same time, the dream of self-entrepreneurialism, and the flourishing eco-systems of a professional ecosystem for both lazy private space owners and wealthy landlord of multiple apartments. While the AirSpace issue has been explored addressing its consequences in term of urban gentrification and socio-economic divide, its effects in terms of the emergence of an impersonal, collective still seductive and recognizable aesthetic atmosphere, has only been anecdotally described. 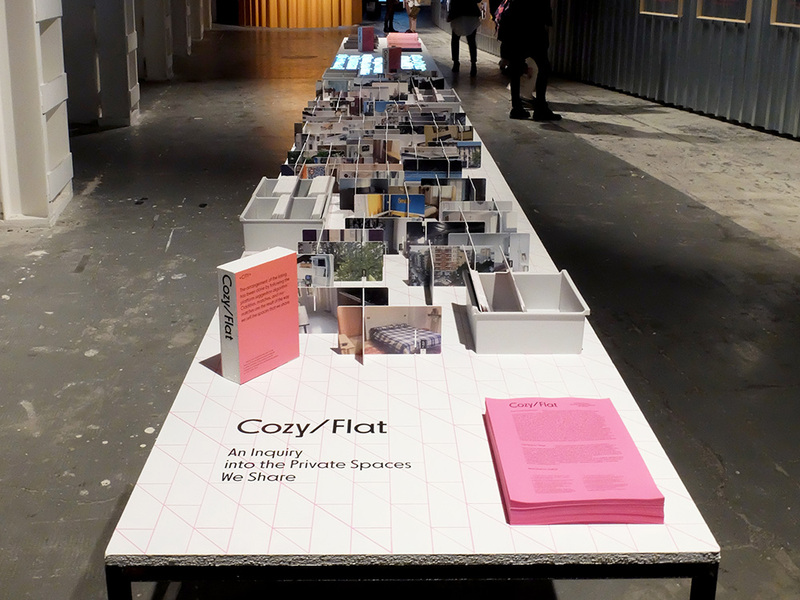 Cozy/Flat explores the aesthetic aspects of the AirSpace phenomenon in Milan. By adopting an evidentiary approach, it tries to expose all the elements that compose it. It tries to expose the Airbnb interface logic —the one that “focuses on pretty pics rather than searches”— along with its contents. The entire collection of listings has been extracted from the platform. The listings have been arranged into price segments. For each listing, it has been retrieved which other similar ones are suggested by the Airbnb recommendation algorithm. For each listing, the cover image has been analyzed to obtain the objects contained in it. Cozy/Flat tries to produce a clash between the search/browse logic of the platform with the sorting/cataloging logic of the human beings. All the scraped and extracted pieces of information have been retrofitted from a single — Airbnb proprietary— database to a multiple —shared and physical— publishing process. < City >Starting from a sample of 230 listings —respecting the overall price distribution ranging from 8 to 4,120 euros—, we have retrieved other 460 listings suggested by the Airbnb algorithm, for a grand total of 690. 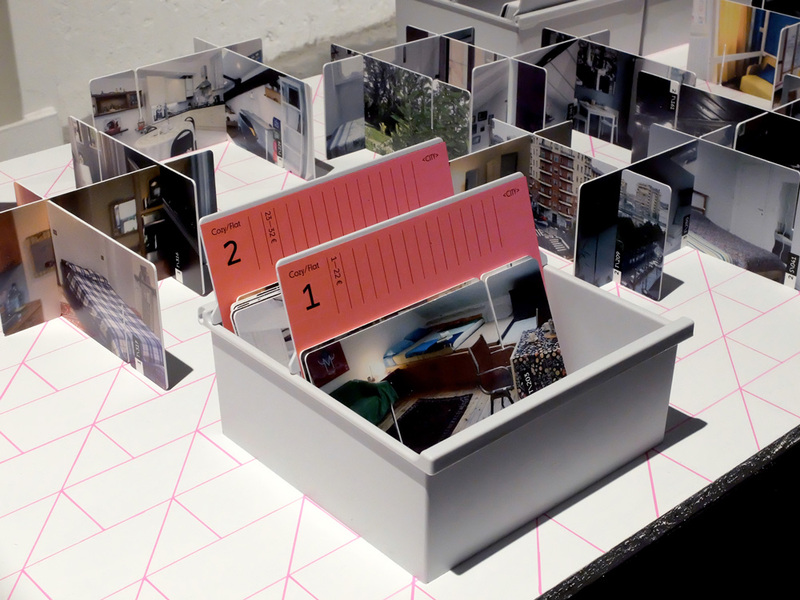 The listings have been printed on slotted cards echoing Enzo Mari’s Fable Game and Eames’ House of Cards. By replacing Mari’s illustrations of fairy tales and Eames’ curated selection of “good stuff”, and by replacing their common combinatorial logic with a strict calculated suggestion logic, City forces to observe the seamless topological propagation of visual tropes associated to price-related effects. From the poorly pictured, small room —where to sleep in a convertible couch—, card after card, we arrive in the luxurious condos of the renewed Isola district. While in the Mari’s and Eames’ games the opportunities to make, unmake and build up visual imaginaries are countless and could be each time invented anew to stimulate imagination, in City the monetary parameters lock down these possibilities. Instead of imagination, is life-aspiration that runs wild. < Spaces > The entire collection of listings cover has been sorted out into 7 categories. They segment a gradient of intimacy. 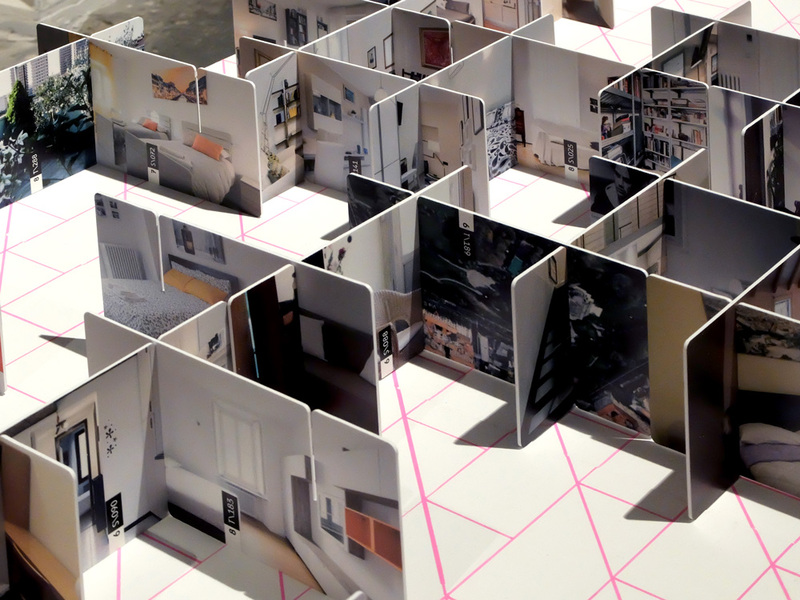 In these categories —from “the city toward the apartments” to “the apartments towards the city”— is projected an entire panorama of possible strategies for marketing a domestic environment: the depiction of an urban landmark; the variegated stylemes of the Milanese architecture; the decluttered and bright living rooms; the exhibition of items with personality; the gardens, balcony and swimming pool where it is possible to have a gaze on the city while hiding from it. < Things > The same collection of images has been processed by a Neural Network, able to identify the objects that are present in them. It crops the pictures and generates a caption for each one of these snips. A selection of 17,500 out of 124,243 cropping have been indexed and cataloged. By leafing through the 11 volumes catalog we might encounter all sort of lamps, couches, chairs, fruits, animals, and humans. For each item category, is also indicated which other ones it is often found in combination with. The catalog expresses the contradictory logic of the platform that seeks to find in every household item a surprisingly reassuring uniqueness. A contradictory logic that, while denies the scale-based strategy of hotels furnishing, imposes a constant imperative to produce differences by emulating somebody else style. It is a cosmogram of domestic objects —captured in its low-resolution manifestation, that screech with the nature of the printed matter. The 3 experiments perform a close and meticulous description of the domestic environment, providing different and open narratives to the transformations proposed by digital platforms. Publishing/Archiving Airbnb could be considered "one of the largest repositories of interior photography on the planet." and for sure it represents, along with other platforms like Pinterest, one of the largest and deepest repositories of the contemporary condition. Cozy/Flat, besides its critical approach to the AirSpace issue, tries to organize a possible strategy to identify what should be de-appropriated from proprietary platforms to be elsewhere re-archived and fed back into circulation. 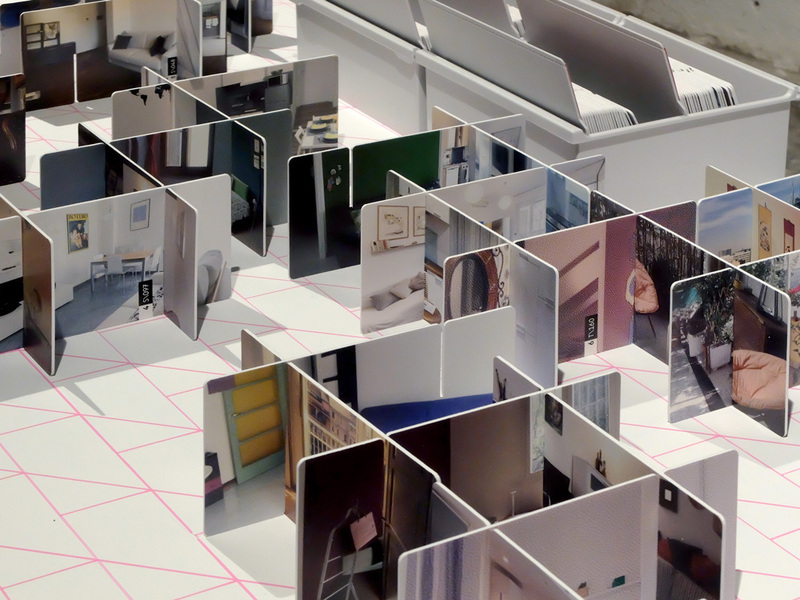 The immense Airbnb repository is constituted of private space fragments, captured by often precarious photographers, uploaded by the users themselves or by other paid middle agents. The liberation of these fragments might be a step to renew our understanding of the city through the lens of its aesthetic features. Cozy/Flat, took as an iterative publishing process, is aimed at exploring other ways of narrating and representing the city. 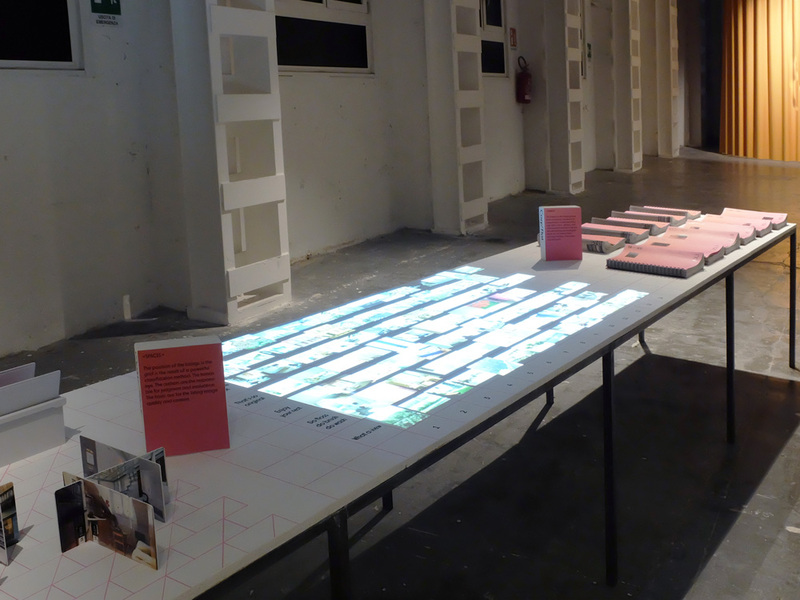 Here publishing is understood as an interface between various human and non-human actors: technologies, algorithms, material, political and ideological conditions and cultural values. In all the Cozy/Flat experiments, the digital matter is transmuted into a physical manifestation waiting for a new digital re-incarnation. 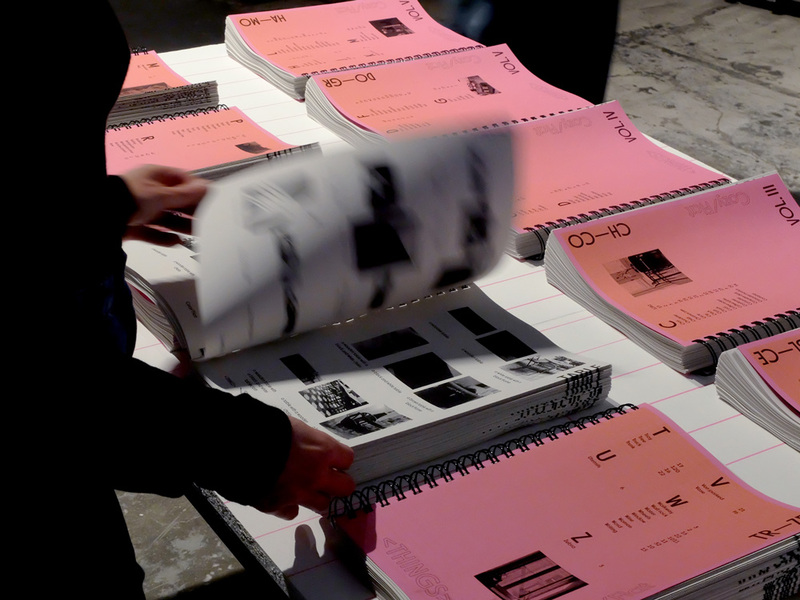 Human practices —cutting, pasting, indexing, taking notes, printing— and computational strategies —extracting visual features, creating clusters of items, arranging items into a specific order— come together in a process of dis- and re-assemblage, enrichment, recontextualization, and conversion. Deliberately, the human practices are not seeking to cover or correct the errors of the machines. On the contrary every misplacement of information or picture, every algorithmic misinterpretation is embraced as a sort of manifestation of the agencies of the calculated space we live in. Investigating web archives and the web as an archive, Cozy/Flat shifts the surface of the screen to a local plane of collaboration to present and to negotiate its findings. Pasquale, Frank. "Two narratives of platform capitalism." Yale L. & Pol'y Rev. 35 (2016): 309. Kottke, Jason. "Premium Mediocre." Kottke.org. Accessed April 03, 2018. https://kottke.org/17/08/premium-mediocre. Chayka, Kyle. "How Silicon Valley Helps Spread the Same Sterile Aesthetic across the World." The Verge. August 03, 2016. Accessed April 03, 2018. https://www.theverge.com/2016/8/3/12325104/ Airbnb-aesthetic-global-minimalism-startup-gentrification. Pavoni, Andrea; Brighenti, Mubi Andrea. “Airspacing the City – Where Technophysics meets Atmoculture”. Azimuth. Philosophical Coordinates in Modern and Contemporary AgeS.I. Intersections: At the Technophysics of Space (2017). Sloane, Mona. "Inequality By Design? Why We Need to Start Talking about Aesthetics, Design and Politics." Researching Sociology @ LSE. December 01, 2017. Accessed April 03, 2018. http://blogs.lse.ac.uk/researchingsociology/2016/09/12/inequality-by-design-why-we-need-to-start-talking-about-aesthetics-design-and-politics/. Carpo, Mario. The Second Digital Turn: Design Beyond Intelligence. MIT Press, 2017. Bowker, Geoffrey C., and Susan Leigh Star. Sorting things out: Classification and its consequences. MIT press, 2000. Johnson, Justin, Andrej Karpathy, and Li Fei-Fei. "Densecap: Fully convolutional localization networks for dense captioning." In Proceedings of the IEEE Conference on Computer Vision and Pattern Recognition, pp. 4565-4574. 2016.